The M600 Turquoise-White is the latest in what has emerged as a theme of colorfully striped pens in the M6xx line-up. It joined the M600 Pink (2015) and the M605 White-Transparent (2017). While white pens can be polarizing, I don’t see any signs of Pelikan backing off of this theme. The Turquoise-White definitely looks much better in person and actually appears more blue to me than turquoise. Despite lacking an ink view window, I think that this one started the year off on good footing. The M120 Iconic Blue, like its predecessor the Green-Black (2016), remains an all out great pen. It is an incredibly reliable writer that makes for an excellent daily workhorse. Its clean lines and classic Pelikan appearance combined with a legendary filling system make this a formidable contender as one of the best fountain pens with a stainless steel nib out there. The blue is a beautiful shade that swallows up the whole pen and looks great with the gold-plated furniture. Just like the model before, it continues to be hampered by exorbitant pricing which is perhaps its only weakness. As I stated in the past, it is a school pen with Souverän pricing. If you can set pricing aside or find a good deal on one, this is one of the best models to have come out this year in my humble opinion. 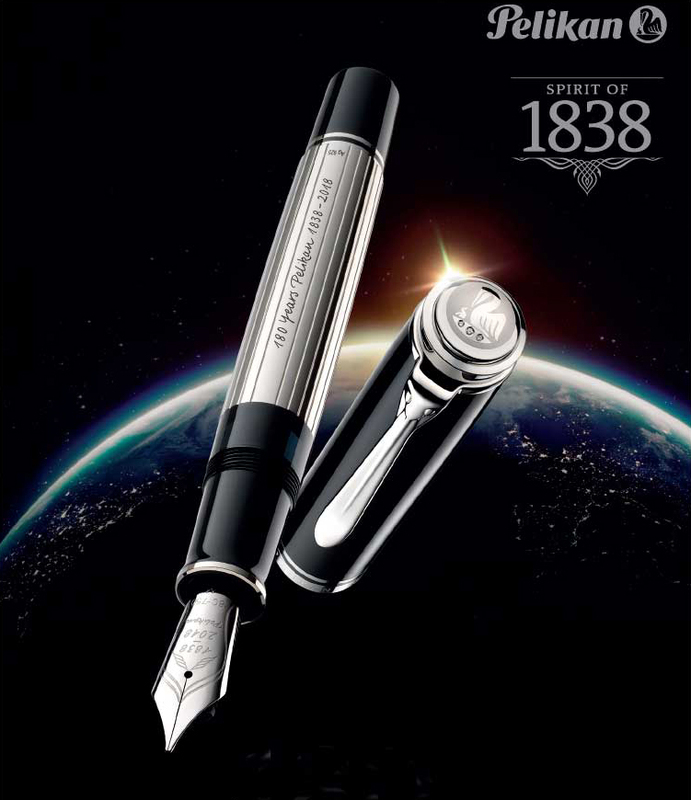 The Spirit of 1838 was a limited edition of just 180 fountain pens built off of the M1000 chassis. 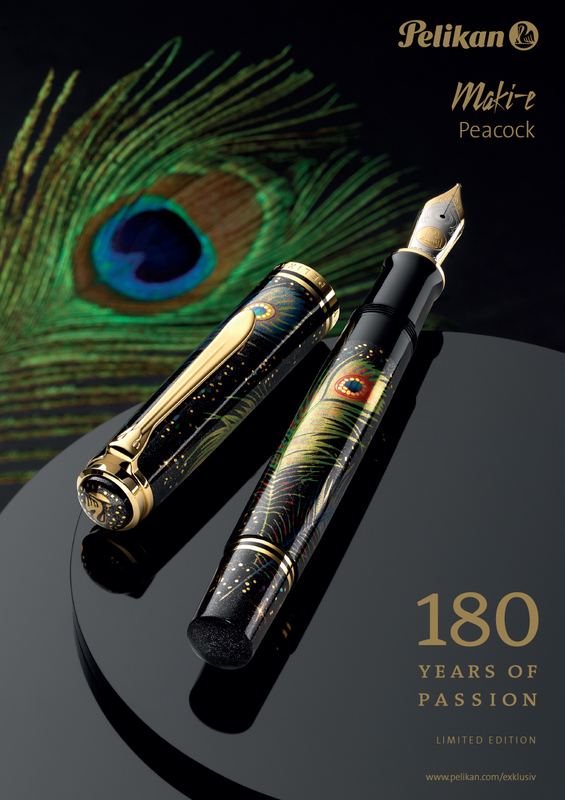 The pelican beak clip, fittings, and barrel are made of sterling silver and the body of the pen is engraved “180 Years Pelikan 1838 – 2018.” The end of the piston knob is engraved with the edition number and the cap top depicts the standard single chick logo embellished with three diamonds along the nest. These are meant to represent trust, reliability, and production in Germany. The nib is rhodium plated 18C-750 gold and was specially engraved for the anniversary. A nice pen for sure but one out of reach for most of us. I had high hopes for this one but it fell a little flat in the looks department for me. Pelikan resurrected a past model from 2005 with the release of the Classic M205 Demonstrator. The pen is adorned with the standard chromium-plated furniture that is characteristic of the M205 line and is distinguished from the original release by a chromium plated crown rather than black plastic. This release was somewhat of a surprise which came and went without much fanfare. Many people do not like demonstrators due to their inherent nature of revealing all of a pen’s acquired imperfections but it is a solid addition for those who do like demos that don’t break the bank. The M815 Metal Striped fountain pen feels worthy of a 180th anniversary year release. It took a long standing theme that represents a company icon and elevated it in a subtle and alluring way. While its design does skirt awfully close to the M805 Stresemann as far as looks go, I think that this one sets itself apart a bit more than it seems, particularly when you see them side by side. The added weight can be noticeable after a while but this is an awesome pen for the those that like a heftier model. Perhaps one of the nicer big birds to come out this year. This Maki-e design was built off of the M1000 chassis and depicts the brightly colored plumage of the peafowl set in sharp contrast against a black background. It was released in an edition of only 111 pieces worldwide. With a hefty price tag and limited availability, only a select few got to enjoy this one. That said, its labor intensive artwork and bright coloring really make it a standout. The M205 Olivine demonstrator was designed to emulate the corresponding Edelstein Ink of the Year which it accomplished in stunning fashion. Rather than being a pure single shade of olive-green, the pen shows varying shades of green along its length. In addition to the chameleonic color scheme, the pen features chromium plated furniture and a stainless steel nib without any plating. I had waited patiently for this one for two years and it did not disappoint when finally released. The Raden Royal Platinum is characterized by alternating verticals of black resin with reflective stripes of radiant abalone which have a much cooler array of tones than last year’s M800 Raden Royal Gold (2017). The Raden Royal Platinum is adorned with palladium-plated furniture characteristic of the M805 line. It was a limited run of just 388 pieces with a bigger price tag that further served to limit its target audience. The M800 Stone Garden brought a bit of subdued color to a year that saw a lot of black and silver releases. The dark blue of this M800 is a nice shade and the marbling on the barrel shows some depth. It really stands out in good lighting and has a darker, brooding look when seen in poor lighting. It is nice to have something a bit different in the line-up and I think the Stone Garden was a pleasant surprise for most. The M600 Vibrant Orange displays an awesome orange coloration with bands of exquisite pearl essence which provide the pen with an amazing level of depth and complexity. That is contrasted by duller bands which were an issue for some, myself included. Still, the colors are compelling and it’s not often we get such a bright and bold Pelikan fountain pen. Olivine followed the brown tinted Smoky Quartz from 2017 and was the seventh Ink of the Year release to date. The olive-green color was fan chosen and is definitely a great addition to the line-up. It is soon to be replaced by 2019’s Star Ruby so now is your chance to pick up an extra bottle or two while supplies last. Garnet was originally released in 2014 as a limited edition and was billed as a dark red. 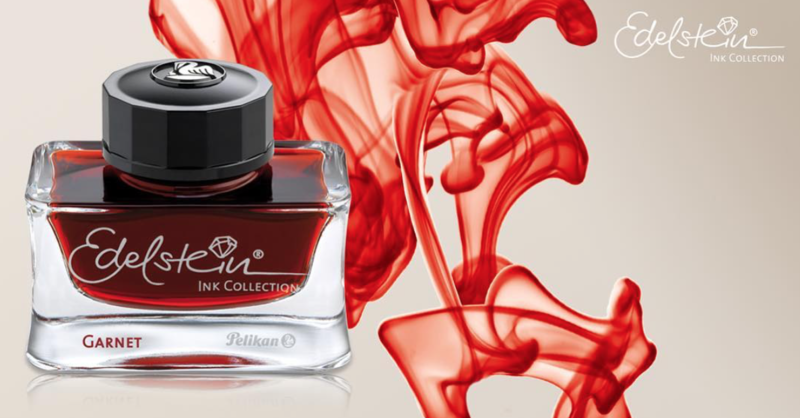 This is the second time Pelikan has chosen to resurrect a limited edition Ink of the Year and add it to the standard line-up which really calls into question any claims of an ink’s “limited” nature. Despite that, many were happy to see its return though I think there are other limited editions more deserving of resurrection than Garnet. In January of this year, I reported that Pelikan pens equipped with an EF nib and sold in the European Union were due for a price increase of 10-12%. This added roughly $12 to $50+ more to the pen’s final price. The United States had been spared from this until the release of the M600 Vibrant Orange. Now all EF equipped models will carry this premium for reasons which still are not entirely clear. These increases have not added anything to the pen’s value and have firmly changed my buying habits to avoid all newly released EF equipped Pelikan pens. This year saw gatherings take place in 181 cities spread across 46 countries with over 4500 registered participants, a roughly 30% increase over the year prior. The Hub masters continue to show no shortage of passion and commitment though frustrations did surface this year after a few missteps on Pelikan’s part. Still, most were able to persevere and enjoy a great night of camaraderie over our shared passion. Pelikan, to their credit, provided a set of Edelstein inks for sampling along with swag for each of the registered attendees. 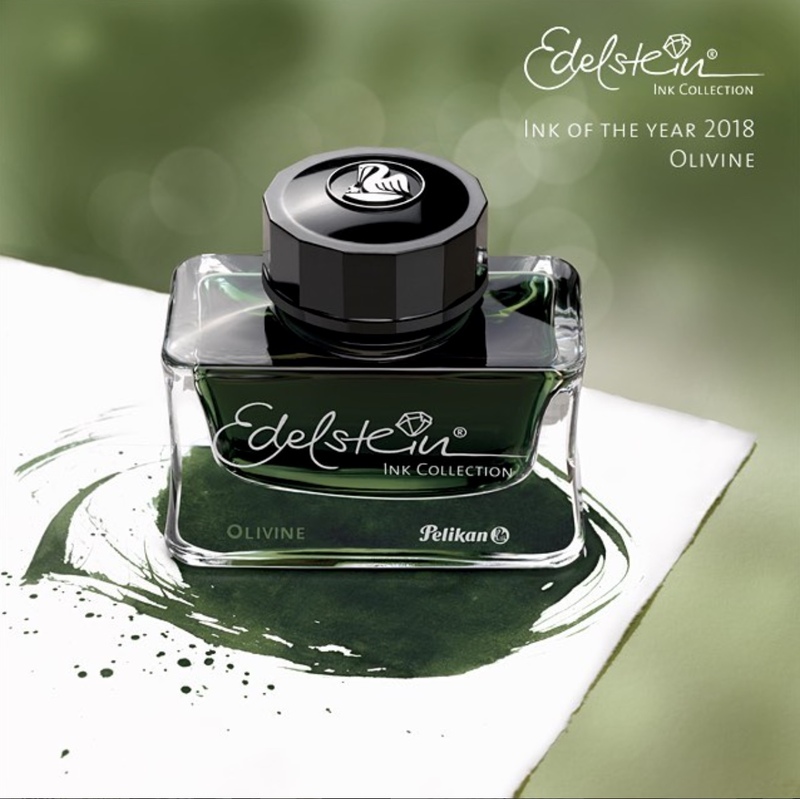 Each registered participant took home a bottle of Edelstein Olivine ink and a 5th anniversary notepad in addition to a copy of Passion, Pelikan’s first edition magazine for handwriting culture. The company also included a large flag which served as a banner for the event. I have always enjoyed this gathering and hope that Pelikan can continue it well into the foreseeable future. It is easy to look back and discuss what we have already been given. It is much harder to look ahead. Pelikan has been very tight-lipped about upcoming releases over the past several years and vendors who violate their contractual obligations by leaking releases do so under risk of great penalty. The company has already provided word of the Herzstück 1929 and Edelstein Star Ruby, both due out in March of 2019. While not yet announced, I think it is likely that we will see an M1005 Stresemann in the first quarter of 2019 as well. This was rumored to be a last quarter release for 2018 but appears to have been pushed back. That is the most concrete prediction I have for next year. Based on past trends, however, I don’t think that it would be unreasonable to anticipate a new addition to their M101N series beyond the already announced Herzstück. I think a pen more appropriately priced for the masses but drawing on that heritage would be very fitting for the 90th anniversary of Pelikan’s fountain pen production. I also think that another white M6xx pen with a colorful striped pattern would be a safe bet as well. We should absolutely expect an M2xx Star Ruby if Pelikan continues the tradition established over the past four limited edition releases. Of course there will be a smattering of yet to be named M8xx releases as well and who knows what other surprises. I think 2019 has the potential to actually be more interesting than this year but only time will tell. As for me, I will continue to endeavor to bring you all of the latest Pelikan news as well as original content into 2019 and beyond. Subscribing to the blog is a great way to stay up to date and be alerted when new post are published. You can find a link in the sidebar to the right. Please take some time to post in the comments below and let me know what you would like to see from Pelikan in 2019. Also, I’m always open to suggestions so if there is a particular topic that you would like to see me tackle in the new year, please leave a note below and I will do my best to accommodate. Thank you so much for your support as that is a large part of what keeps me going. Have a safe and happy holiday no matter what you celebrate. See you in the new year. Thanks Joshua for all the great posts this year; I really enjoyed it. Fun and helpful! My personal favorite release of the year was the Metal Striped. I look forward to more fun in 2019. I hope it’s a Happy New Year for Pelikan enthusiasts! Next Christmas, I’m hoping for a M1000 Red Black release! You’re welcome and thanks! Metal striped is a great choice. I think an M1000 Red/Black, while awesome, would take a Christmas miracle to realize. > would take a Christmas miracle to realize. Why this? If you propose it to them and they like your idea and the idea survives the many go/stop decisions which every product development in any field has, it could become true. Personally, I would like to a have an M1000 in vermilion. Pelikan could then compete with Namiki or similar pens – the advantage of Pelikan would be that it is a Piston filler. What I would not like is a red pen with black ends. That is horrible – it would look like a bellboy uniform – Pilot Custom Urushi Vermilion and Custom 845 Vermilion are such misdesigns. Especially great would be such a red M1000 with an ink window. Anyway, reading that eventually a M1000 Stresemann will come out – that is already something. I think it takes something like 2 years for a Pelikan to go from concept to production. The M1000 doesn’t get a lot of love but I like your idea. Let see what next year brings. Josh, thanks for a great year in keeping us updated on the latest and greatest Pelikan has to offer. As for what would I like to see next year it would be the return of the M8xx Black/Red. So thanks again and enjoy the holidays. You’re welcome! Such a great color. I wonder if it’s the case of something that really wasn’t appreciated until it was no longer available. I think you have a very solid idea about the M8xx B/R, sometimes you don’t appreciate what you have until it is no longer around. Just a final note, I added the M600 turquoise/white, M800 Renaissance Brown and the M800 Stone Garden to my flock this year and actually I’m very pleased with the Stone Garden. It is on the conservative side but then again that is something I expect from Pelikan and the colors when held in the light are quite nice. If you enjoy the more flamboyant go Italian of which I do own a few Visconti’s and love them also. If there is one constant that can be applied to Pelikan, it is their conservative nature. It’s rooted in the culture and not likely to change anytime soon. Yes, thanks Josh for both the frequency and caliber of your postings. I have a negative preference for 2019–that Pelikan will drop the semi-translucent caps in such as the M800 Renaissance Brown and M600 Vibrant Orange. And yes, a return of the black and red stripe M8xx would be sweet. Happy holidays! You’re most welcome. I can see where you are coming from though I don’t think that will be the case. They have really favored these translucent materials in recent times. What about the M805 Ocean Swirl? Did it come out on 2017 and I was just very slow to pull the trigger? That was indeed a 2017 release. We learned about in in September 2017 and it became available around November 2017 if I recall correctly. 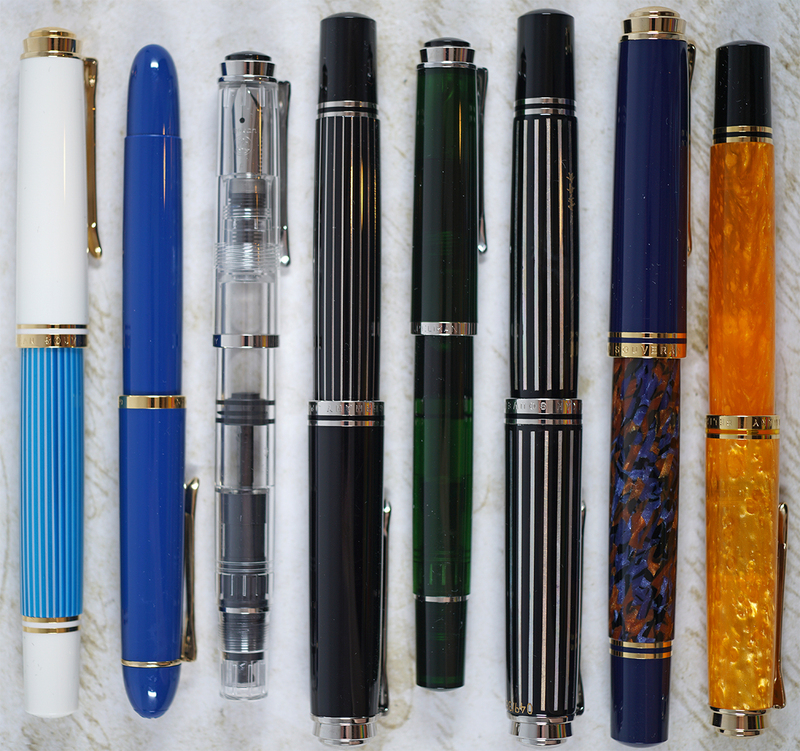 Three of the 2018 Pelikans joined my flock this year: the Iconic Blue and the Vibrant Orange M600 were practically instantaneous purchases because of their colors. When I was able to compare the M800 Stresemann and the M800 Metal Stripe at the DC Pen Show, the Metal Stripe won easily. I think it is one of the most elegant and professional pens Pelikan has produced. Thanks for all the time and effort you put in to keep us informed! I think you certainly got some of the best of the lot this year. I agree with your assessment of the Metal Striped compared with the Stresemann as well. You’re welcome and thanks for reading. Thanks for the Year in Review of the line of new Pelikan pens produced along with the inks. I also am very impressed with the quality of writing and photos. Top notch!!! No need to respond. i just wanted to say that I am reading and that I appreciate both the news you provide and the historical context you take the time to give. This is one of my favorite FP blogs. I’ll just echo what others have said–thank you for all your research and for keeping us Pelikan lovers in the know about what’s going on in Pelikan world. One of the highlights of my year was picking up an Ocean Swirl at the store in Hannover on the grounds of the former factory. I was able to visit the store with my son and son-in-law who now are beginning their own collection of Pelikan pens and inks! Very neat that you were able to get your family interested. My wife has zero interest in joining our hobby. Congrats on the Ocean Swirl. I’m very jealous of your experiences in Hannover. Thanks Josh! It’s a pleasure reading your comments & insight on all things Pelikan. A new releases of an M101N would certainly be welcome, especially since they seemed to have stopped doing so after the fairly regular schedule. I’m curious if you have any thoughts as to what that release might be?? Perhaps it would be something that harkens back to the original like a black, green, or gray. This website is a pleasure to read and receiving news of a post always makes me happy. As for Pelikan releases, I must say that 2018 was a bit underwhelming for me. We only got the M600 Turquoise, the M815 and the Stone Garden. But the Stone Garden is my least liked M800: to me the colors just don’t work. The turquoise is gorgeous though and the M815 is one of my favorite M8xx – I would love to see other M815s, particularly a blue one (one can dream 😉 ). I agree that 2019 does seem promising, with the stunning Herzstück (waay above my budget, though) the announced IOTY and, maybe, the fabled M1005 Stresemann 🙂 . I do hope the M8xx are a bit more colorful this year (do I hear red? 😀 ). Thanks Luiz. I can see how the Stone Garden came in a bit underwhelming. Not sure what color schemes are planned for the coming year’s M8xx line but I believe our friends in Hannover will continue to skew somewhat conservative. Hoping to see a pop of color though. You run a wonderful blog Joshua, thank you not only for keeping the world updated with things Pelikan but also for the way you write – very readable and entertaining, a joy to read. Highlight for me this year was the Metal Striped – which is currently my daily user. Stone Garden a bit disappointing and Platinum – well what can I say! Thanks again and Happy Christmas to you and yours. Thanks David. I guess paying attention in English class paid off after all. The Metal Striped appears to be the consensus winner amongst many of those that I’ve polled and the Stone Garden just as disappointing. Merry Christmas and thanks for reading. 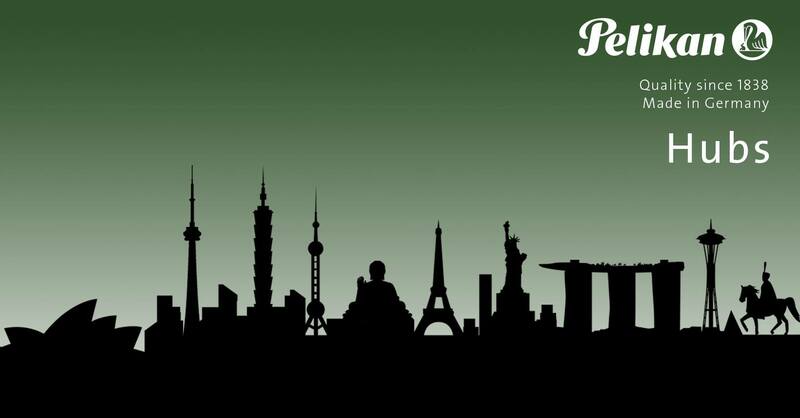 I just recently discovered Pelikan’s Perch and I applaud you for your effort in creating a great “newsletter”. I have learnt so much from your columns. Thank you so much for what you do. I received my VO in the mail a few days ago but only checked to see if the pen was there. I am kind of fearful to open it since I didn’t purchase the Ocean Swirl because of the dark bands. Hopefully, it won’t be a huge disappointment! Can you please tell me why the Vibrant Blue was a M8xx but the VG and VO are M6xx? Thank you for your time and Happy 2019 to you. Welcome to the site. I’m glad that you found it and have enjoyed my content. It’s definitely a labor of love but made worth it knowing people enjoy what I do. Open that M600 up. Bright or dull, I’m sure that it will still be stunning. No rhyme or reason as to why the M600 line got Vibrant Green and Orange and the M805 line got Vibrant Blue. They had green and orange M320s as well so it seems that its just what mood strikes as to what form factors the vibrant colors come to. Love the articles on Pelican pens, always enjoy reading them. Thanks Tom! Have a great holiday. Thank you Joshua for all of your frank observations and efforts to keep us all abreast of the Pelikan world we inhabit. Wishing you and your family a great holiday and a happy New Year. You’re welcome Keith. Thanks for stopping by and have a great holiday. You run the best Pelikan blog that exists right now. Congrats! A great job, made carefully and with love. But I am really upset with Pelikan. I only collect M400 size (I have near 60) and M200. Since Stresemann model Pelikan has not made anything for M400. So, I am not able to buy more Pelikans and that makes me sad. It is ok for a new M101 model of course (Bright Red was not brilliant but I got it), but I really would like, for example, an orange model for M400 like they did for M800. Anyway, in these days when most of the iconic brands of fountain pens have disappeared or become something else, it is to appreciate that Pelikan is still fighting. I admire them but come on! Please make some M400 model!!!!!!! I don’t think that there are too many Pelikan specific blogs out there so it’s not hard to be #1 ;-). I appreciate your kind words. The M400 has been a bit neglected in recent years. The Brown Tortoise and Stresemann were nice additions but that was 2016. Haven’t really heard about much action on the M400 front for next year as of yet. Thank you for all your efforts into bringing us news and temptations. All the best to you in 2019! What happened to my reply from yesterday? Sorry. Busy weekend at work. Got stuck in the queue waiting approval. All good now. M600 Tortoise is all I care about. I’m waiting for that blessed day. Unless they released a full tortoise M101n…..then I’d be in trouble. Y’know, like the 1930’s models with the matching tortoise caps? Doubtful, but that would knock my socks off. That would make an awesome M101N release. Sadly, I haven’t heard word of either such model coming this year. Doesn’t mean it’s not happening but certainly nothing that’s come to my attention. Of course, I’ll report back if I hear anything. Great abstract. Thank you very much.